Darrell is a reflective, brilliant young man, who never thought of himself as a good student. He always struggled with his reading and writing skills. Darrell's father, a single parent, couldn't afford private tutors. By the end of middle school, Darrell's grades and his confidence were at an all time low. Then everything changed. 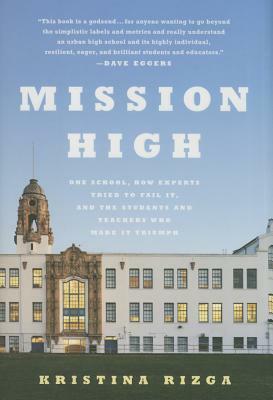 So, why has the federal government been threatening to close Mission High--and schools like it across the country? The qualities that matter the most in learning--skills like critical thinking, intellectual engagement, resilience, empathy, self-management, and cultural flexibility--can't be measured by multiple-choice questions designed by distant testing companies, Rizga argues, but they can be detected by skilled teachers in effective, personalized and humane classrooms that work for all students, not just the most motivated ones. Based on four years of reporting with unprecedented access, the unforgettable, intimate stories in these pages throw open the doors to America's most talked about--and arguably least understood--public school classrooms where the largely invisible voices of our smart, resilient students and their committed educators can offer a clear and hopeful blueprint for what it takes to help all students succeed.